These last couple of weeks have been a bit of a blur. We traveled over Thanksgiving, I found out I’m a finalist in the Hidden Valley Ranch Ultimate Lunchbox Competition with the Food Network, and, well, we have a toddler. We don’t get snow where I live so we’re always trying to figure out fun ways to get into the holiday spirit. Our tot is just about three so she’s still unsure about this whole “holiday” thing. We are trying to celebrate Jewish holidays as well as, um, my stuff, which is more about tradition than anything else. So we got a tree, put on the decorations, and couldn’t find the menorah. We substituted some sparkling candles instead and then watched as the tot rearranged all the ornaments on the tree. And some of those ornaments are real and old and special. After moving them all out of her reach, the whole bottom half of the tree looked pretty sad. So, with the tot’s help, we created a couple of really adorable homemade holiday ornaments using a collection of twigs from the yard. These ornaments are super easy and so much fun. And your kids can put their own spin on things by adding whatever picture they’d like or even leaving the picture out all together. Start by collecting twigs from the yard and then grouping them according to shape and size. 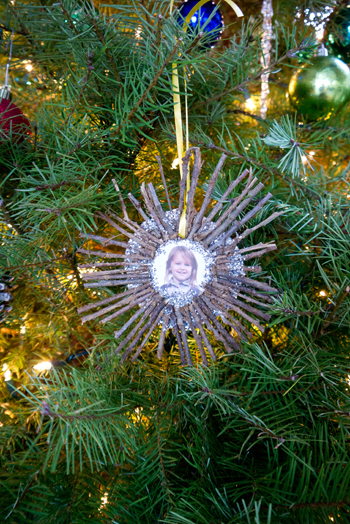 Your child can create big thick twig ornaments or tight-packed skinny ones – either way, the ornament looks really cool. Now invite your child to trace around a coffee mug with a washable marker. This is the base of the ornament. Go ahead and cut out the circle or offer assistance if your child isn’t ready to wield the scissors. 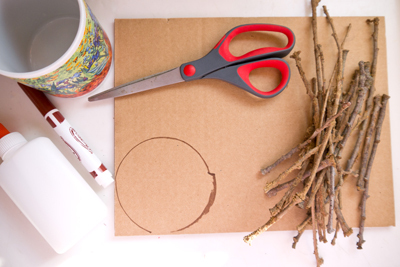 Help your child out by using the end of the scissors to punch a hole somewhere along the outside edge of the inner circle to use for threading a ribbon for hanging later. Create a smaller circle in the middle by tracing around a smaller glass (a shot glass works perfectly). Offer your child the glue and encourage her to slather it on all around the outside of the inner circle. This is a great project for younger kids and introducing the concept of staying in – or outside – of the lines. If you’ve got older kids that are comfortable using a hot glue gun, they can use instead. Encourage your child to start lining up those twigs around the outside edge of the inner circle packing them in tightly next to each other. She can continue moving around the circle until she’s got a full ring of twigs. Now she can cut and paste a small circular picture in the middle, sprinkle things with glitter, and let things dry overnight. 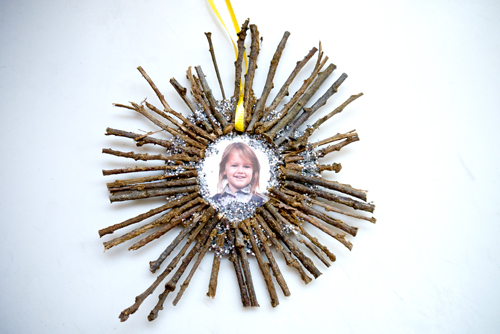 Or, leave off that glitter and you’ve got a totally eco-freindly holiday ornament! Once things are all dry, gently shake the ornament over a sheet of paper to release any glitter that didn’t stick. If any twigs shake lose too, go ahead and glue back in place. Offer your child a length of ribbon to string through the whole, give things a tie, and you’ve got a creative homemade holiday ornament!